I walked past a neighbours house on my way home just now and she was tending her front garden. I said ‘Hi how are you?’ and before I had chance to comment on the glorious poppies I’ve been admiring for the last week, she said ‘Would you like some of these seed heads when they’re ready?’ Did I pounce? You bet I did! So with a bit of luck this time next year I’ll have my own. Imagine when I saw that the photo challenge this week is vivid, it was made for these flowers don’t you think? If anyone knows what variety these are, my neighbour and I would both love to know please. Thank you, and I’ve rewarded her with cuttings! Lovely photo – possibly some variety of the Opium Poppy. Thank you, apparently its a variety called Ladybird! Aren’t they just gorgeous, Gilly? I love them! And what a nice neighbour 🙂 Happy weekend! She is a sweetie and is teaching her little boys to appreciate gardening so I think that’s great. I’ve given her some cuttings! They’re a heady looking variety… they want to make one dance with that colour.. The colour is even more intense in real life! You can never have too many poppies! 😀 😀 😀 That is true as well. Leaves Sydney Vivid for dead. And the wonderful sharpness of the centre in the poppy on the left. Not too bad for a phone! Beautiful poppies, I don’t know their name last time I saw poppies like them they were being grown by tribes people in the Golden Triangle. As in India you mean? I didn’t see poppies there, but I did learn that these are the variety Ladybird! I am no authority but they looked the kind. I declined an offer to try it out as it was legal for any one over sixty there. Red is such a vibrant and vivid colour, well chosen for this theme Gilly. Gardeners are the most generous of people aren’t they? 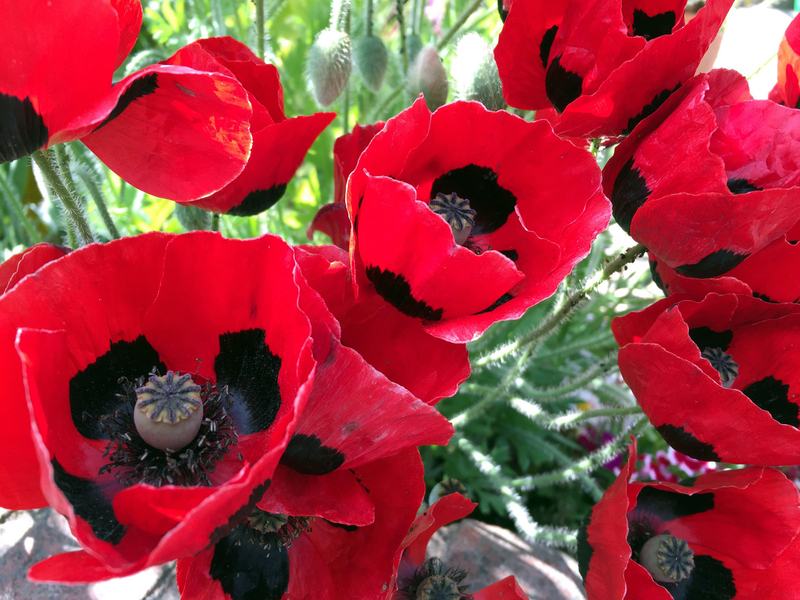 Can’t wait to see your own poppies vivid photos next year! what a nice neighbor. I hope they grow and the neighbour is teaching her little boys about gardening, wonderful! Even more so ‘in the petal’ so to speak! Beautiful – I love the way gardeners love to share!